SOAR has held two build days so far in February, on the 4th and the 11th. During these workdays extensive progress was made in all of SOAR’s major projects, including NSL and LDRS. Don’t miss us at the USF Engineering EXPO tomorrow! The NSL computer science team continued to develop the code for both the steering and the vision systems in the landing module. The module can now turn towards a GPS destination and fly in that direction. Current remaining challenges include accounting for wind speed and optimizing the vision system code. The navigation code is located on GitHub. The mechanical engineering team also worked on the landing module/steering system, and are on track to finish the hardware by February 18th, barring any setbacks. The main issue facing this team is a design flaw in the top of the landing module, where the strip of phenolic is too thin and needs to be reinforced. The rocketry team prepared the full-scale rocket for this weekend’s test launch by completing all the aeropoxy fillets, installing the black powder reservoirs, constructing bulkheads, packing and fitting components, preparing the simulated weight payload, installing shear pins, and installing the motor retainer ring. The LDRS team continued to prepare for the event by installing carbon fiber over the fin fillets and working on the second stage of the rocket. 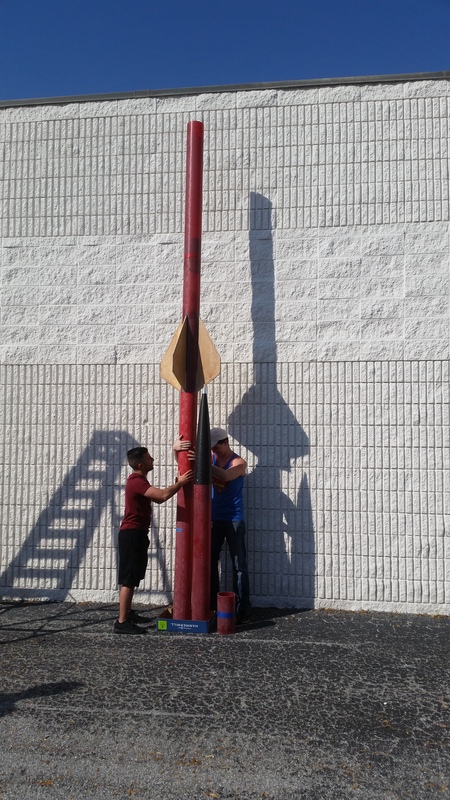 All components were successfully test fit and the 24′-tall fully-assembled rocket will easily top the height of a multi-story building. Partially assembled LDRS rocket, with people for scale. This does not include the nose section or rear fins.